It’s not if, but just a matter of when. 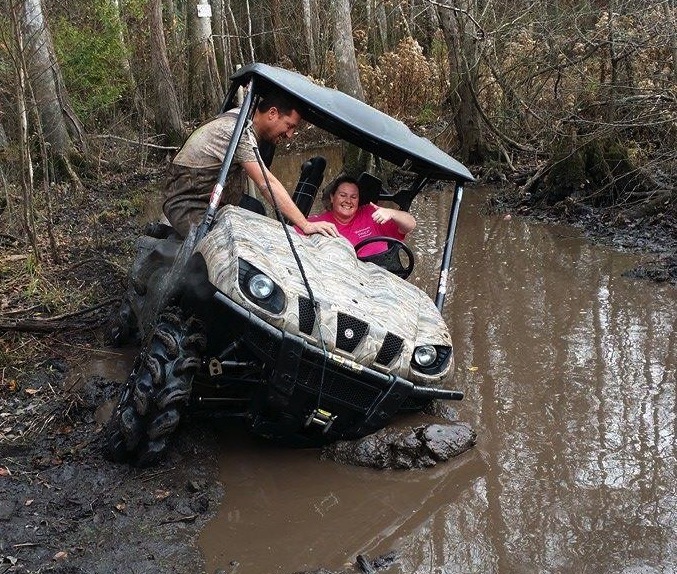 Yeah, your UTV can handle some pretty extreme terrain. It can crawl over rocks and stumps and make it across mud and water too. 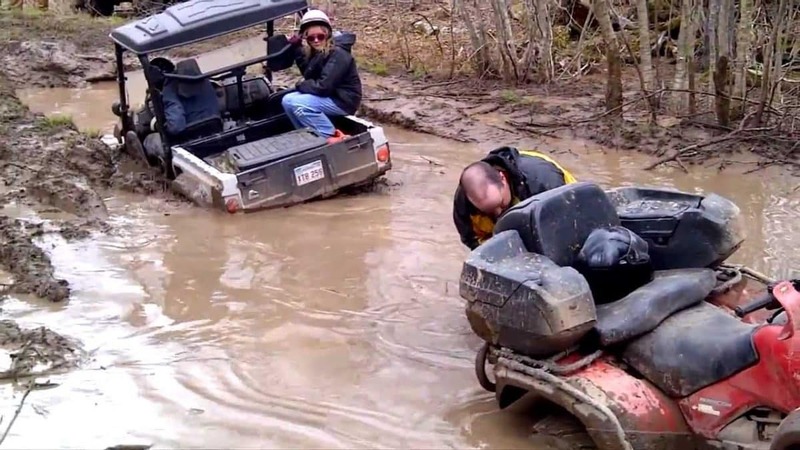 However, there will come a time when the mud is deeper than expected or you just don’t get to attack it with the angle and speed you’d like. 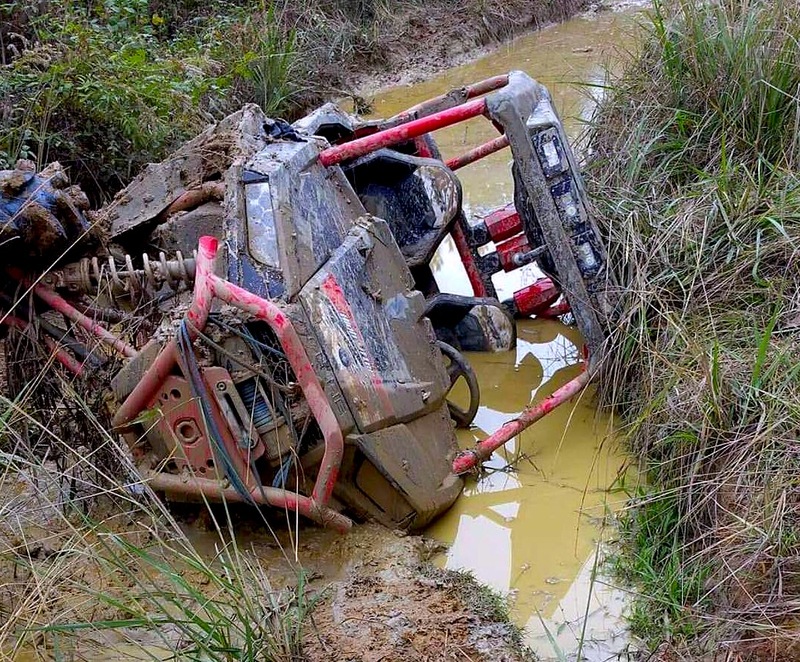 So, your forward motion is delayed while you figure out how to get unstuck. But hey, that’s part of the fun. Normally, what happens in the swamp stays in the swamp. but here’s your chance to see what really goes on. 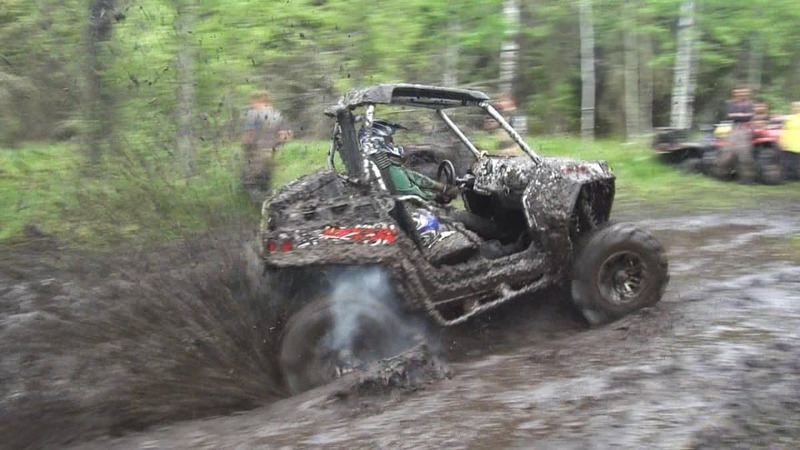 There’s a reason why you want to have a winch mounted on your UTV. It’s your ticket to escaping a bad situation. 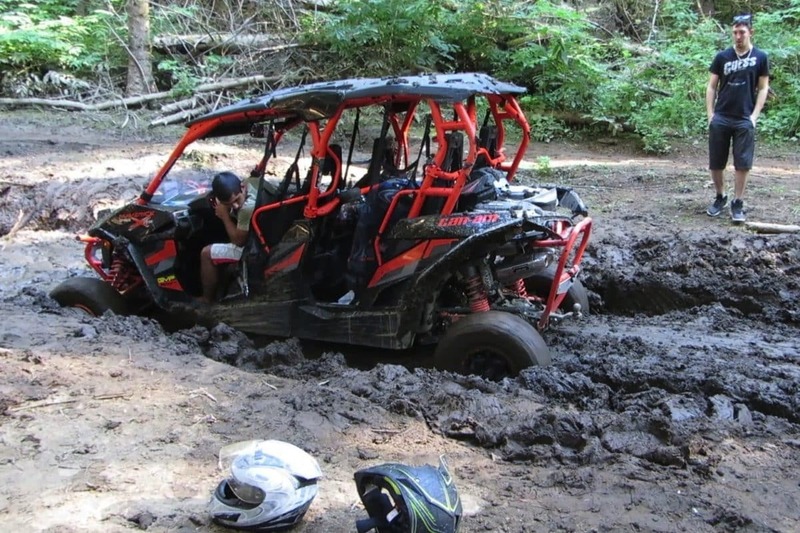 The good thing about a 4-seater UTV is you have more people to push and pull. 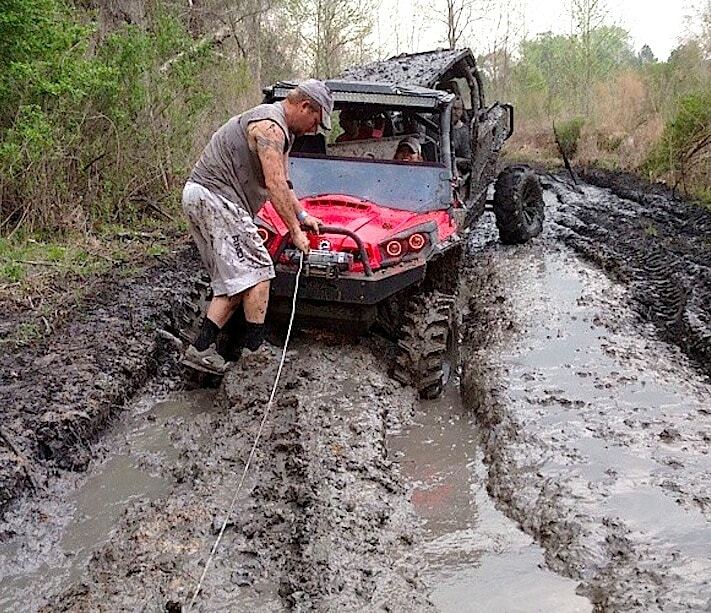 It’s good to have friends when you’re stuck in the mud. 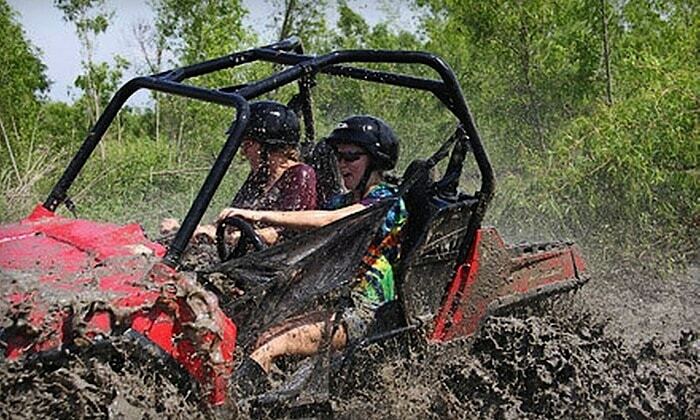 Going on a group ride with multiple vehicles is better than riding alone. RETREAT! When in doubt, back it out. Practice makes perfect. 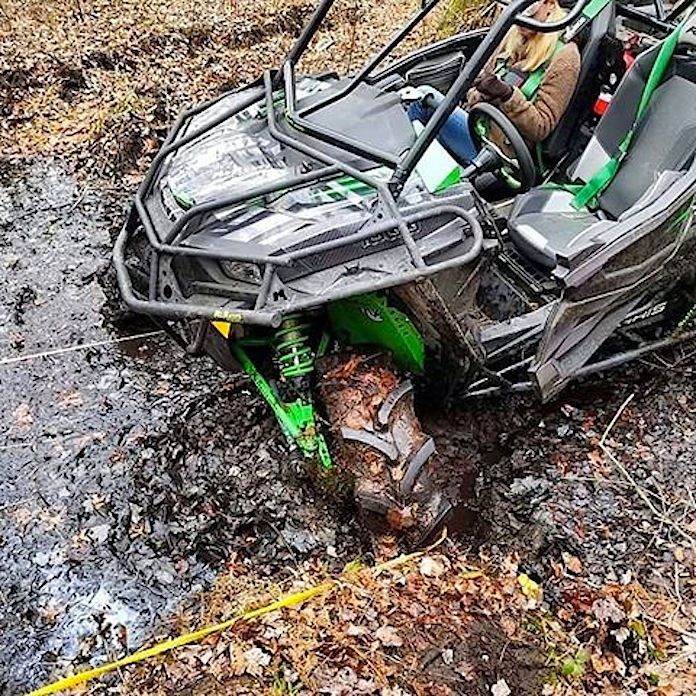 After getting stuck a few times, you learn what to do and are back to moving down the trail in no time at all. It’s important to maintain a good attitude. 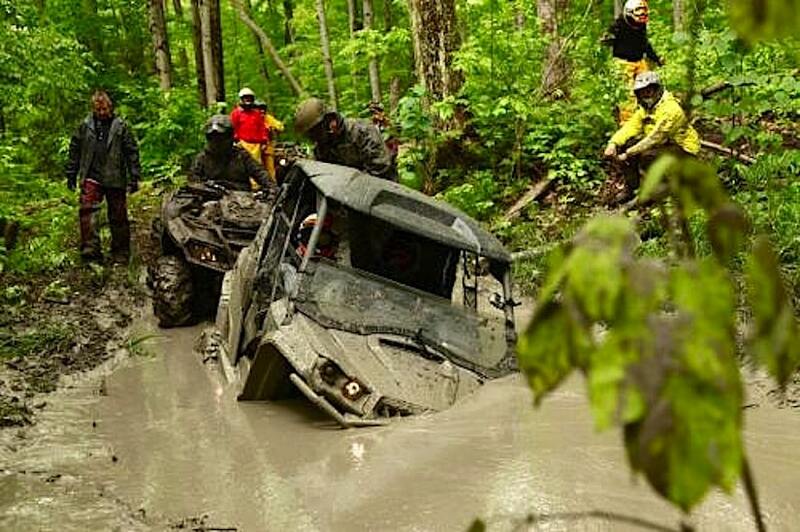 It’s the only difference between an ordeal and an adventure. Here’s what they mean when they say a tire has good self-cleaning capabilities. You don’t want them to pack up with mud and become four beach balls. That don’t look right. 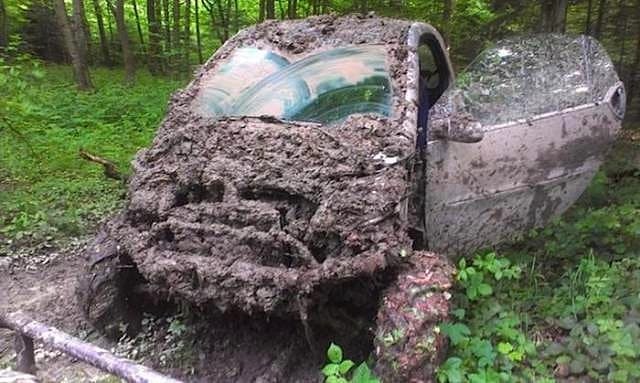 You have a better chance of getting out if the front tires are pointed straight. It may be time to abandon ship when it begins listing to one side too much. 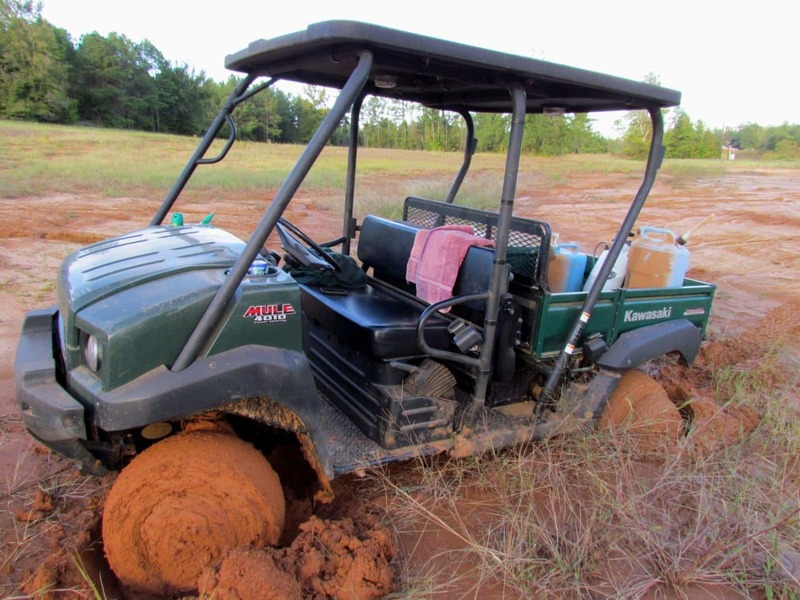 It may be good for moral when you see the tires churning, but it doesn’t help if they’re only digging a hole. 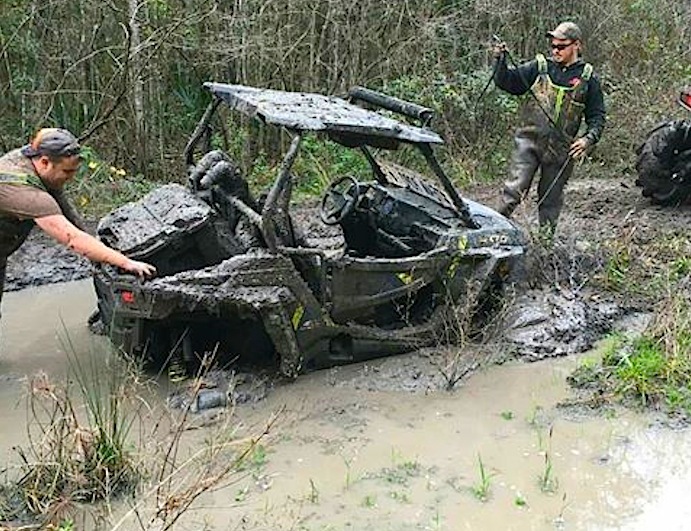 A Smart car is not a UTV. This is what it’ll look like if you try to use it as one. 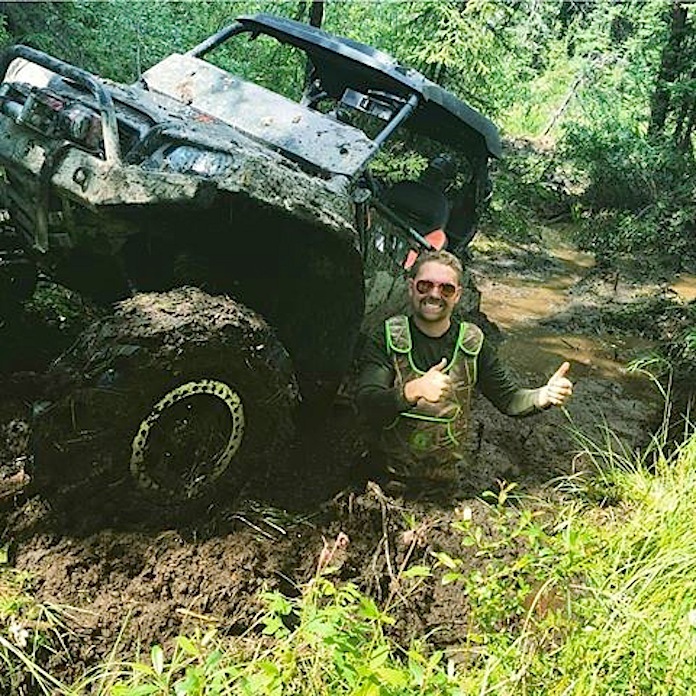 Yes, playing in the mud is fun and the more you do it the more you learn how to avoid getting stuck. Time to change drivers. 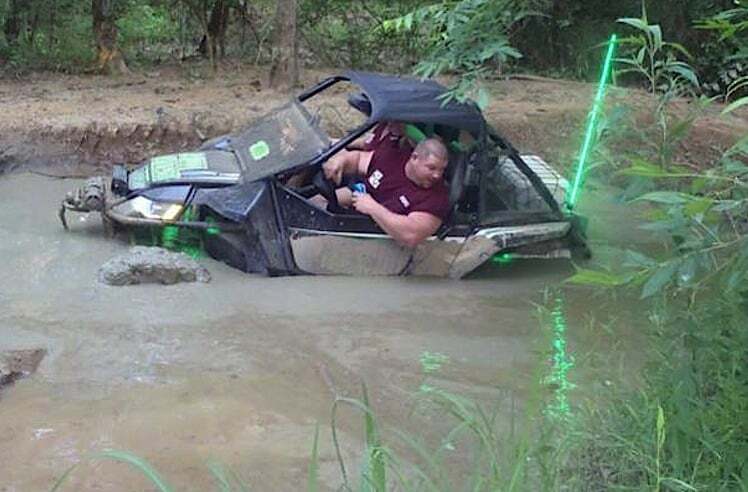 Not everyone is an expert swamp pilot. 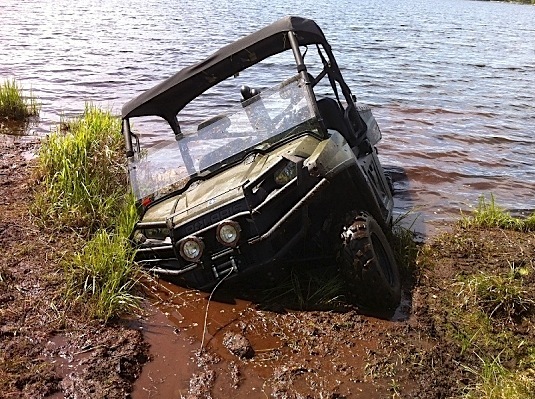 So, you make it across a lake and get stuck right as you get to land.